An Awesome Pitch Reel For A Restored/Special Edition Version Of The Classic BATTLESTAR GALACTICA!! UPDATE!! Behold An Awesome Pitch Reel For A Restored/Special Edition Version Of The Classic BATTLESTAR GALACTICA!! New FX!?!? The wonderful Bill Hunt over at The Digital Bits posted a piece about this demo reel below - correctly identifying its driving force as Adam “Mojo” Lebowitz. Mojo has been around for some time, having served in various capacities on some high-end, high-visibility Geek favorites. He was a Senior Computer Animator on BABYLON 5, a Visual Effects Supervisor on the lovely 2001 restoration of STAR TREK: THE MOTION PICTURE, a digital artist on SERENITY, a Computer Graphics Animation Supervisor on STAR TREK: VOYAGER, a previz artist on JOURNEY 2: THE MYSTERIOUS ISLAND and OZ: THE GREAT AND POWERFUL. And, most relevantly, he was a CGI artist on Ron Moore’s reinvention of BATTLESTAR GALACTICA. This reel is not ‘new’ per se, which we understood when posting it. However, hopes to press forward on a ‘Special Edition’ of the original BATTLESTAR GALACTICA have recently heightened in light of new attention the show has been receiving in the slipstream of creator Glen A. Larson’s death, as well as the impending release of Seasonal Blu-ray sets in the UK (a few weeks from now - region free!) and in the US (early next year). There’s a flurry of interest in the classic show right now…and in this business, timing is everything. Over the years, I’ve written extensively here on the site about my love of the original BATTLESTAR GALACTICA television series. Having recently revisited it via THIS German Region B Blu-ray issuance (which is fantastic, by the way), I remain amazed by the number of chances the show took in terms of its approaches to faith (or the questioning there of), its handling of grief and loss, and illustrating the effects of war and adversity on not only adults - but children (notably Noah Hathaway’s Boxey). 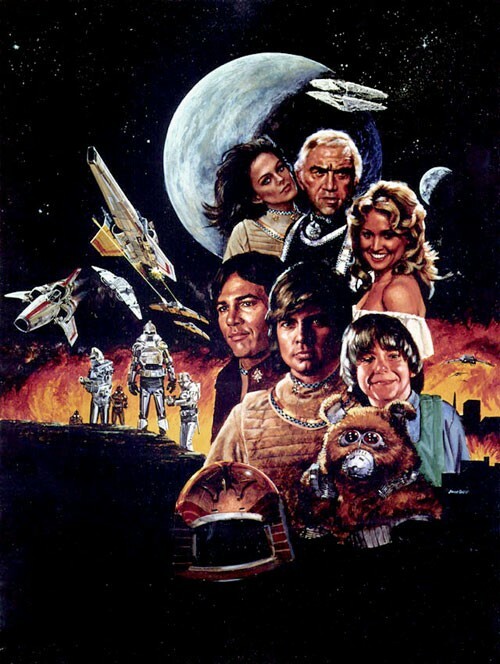 The show impressively nailed its thematics of religion vs pragmatism, military vs government, the haves vs the have nots, father vs son, and suggested a far bigger and bolder universe than its first season - and its considerably less visionary follow-up GALACTICA 1980 - had a chance to fully explore. Thus, I strongly assert that - despite its many shortcomings and frustrating elements - the ‘classic’ BATTLESTAR GALACTICA never got its due. It never found the innate corporate support of fan traction that so dramatically characterizes STAR TREK, and was roundly overshadowed by Ron Moore’s 2004 reinvention of the concept. Yet, somehow, the original series abides. As such, the content of Siress Belloby’s recent e-mail to me quickly caught me attention, and got my Geekly juices flowing something fierce. Embedded below is a test reel - a demo reel - a proposal reel - for a restoration of the original BATTLESTAR GALACTICA. Belloby indicated that we should think of this proposal along the lines of the recent restoration of STAR TREK: THE ORIGINAL SERIES. I.e. visual restoration, new effects work, etc. One interesting (and tragic) element of the original BATTLESTAR is that simple, raw production limitations frequently prohibited the series from fully realizing many sequences. Thus, the delivery of fresh effects was often minimum, and stock footage frequently ruled the day. The use of stock footage is not terribly uncommon (Nicholas Meyer reused some shots from the first STAR TREK film in WRATH OF KHAN, for example). But when one sees the same ships flying in the same formation…or fighting the same battles….week after week, such slights of hand becomes pretty wobbly - and the sequences they’re employed within feel less fresh than they should. Presumably, a restored classic BSG would finally, at long last, resolve such discrepancies and produce full-on sequences where…before…stock footage was deployed. You see a little of this in the clip below. Also, I love the editorial tempo of this sequence, and the furious motions of the fighter craft involved in this reel. The nature/range of motion here…and the collateral effects it has on this sequence’s pace…is hugely impressive. To be clear, this is a proposal currently being put forth to The Powers That Be. A restoration of the original Galactica series is not official and may never be so, and this reel is a tool to convince - not officially sanctioned at this point in time. This is, however, a sampling of what we might expect should the Gods shine upon whomever is putting this together. My personal thinking is: if this is what these folks can do with no budget and on their spare time, bankroll ‘them and let them at it! And then, just maybe, folks will be better able to see the original BATTLESTAR GALACTICA for all that it truly was, and can still be again. What better way to honor the recent passing of GALACTICA creator Glen A. Larson than allowing one of his most enduring creations to shine more brightly than ever before?